Ireland produced a stunning display to beat New Zealand at home for the first time, prevailing 16-9 in a thrilling tussle between the world's top two teams. Two years after their maiden triumph over the All Blacks in Chicago, Joe Schmidt's side treated the Aviva Stadium crowd to a slice of glorious history on Saturday. Jacob Stockdale's second-half try was pivotal after a fine opening 40 minutes had yielded only a three-point lead, courtesy of Johnny Sexton's kicking efforts. New Zealand, who had not suffered defeat in Europe since 2012, dug deep in an attempt to engineer a way back into the contest but found Ireland in no mood to surrender their hard-earned lead. It marks yet another high point for New Zealand-born Schmidt's Six Nations Grand Slam winners, who will hope to maintain this form all the way to the 2019 World Cup in Japan. Amid a tremendous atmosphere it was the world champions – narrow winners over England last weekend – who made the early running, forcing Ireland to defend doggedly from their five-metre line before a home penalty alleviated the pressure. Devin Toner's huge hit on Brodie Retallick summed up Ireland's commitment in defence and cranked up the decibel levels even further. It took Steve Hansen's men 16 minutes to get off the mark, the prolific Beauden Barrett splitting the posts with typical assuredness. Ireland's growing sense of ambition was evident as Sexton kicked for touch when well placed to double his tally and the bold move almost paid off when CJ Stander was held up over the line. There was another false dawn in the hosts' next attack as Rob Kearney spilled the ball with the try line at his mercy, but Ireland did have the consolation of Sexton's penalty restoring their lead. A Barrett drop-goal quickly levelled matters but Ireland had the 9-6 advantage at the interval courtesy of Sexton's kick on the stroke of half-time. Stockdale breathed a huge sigh of relief when his attempted chip over Kieran Read was blocked, but the usually reliable number eight knocked on when safe handling would surely have led to a try. When the time came, Stockdale proved the hero at the other end, making no mistake with a kick over the top which he chased down and dotted over the line. Ireland initially looked to build on their lead, but soon found themselves forced onto the back foot as the All Blacks looked to click into gear. 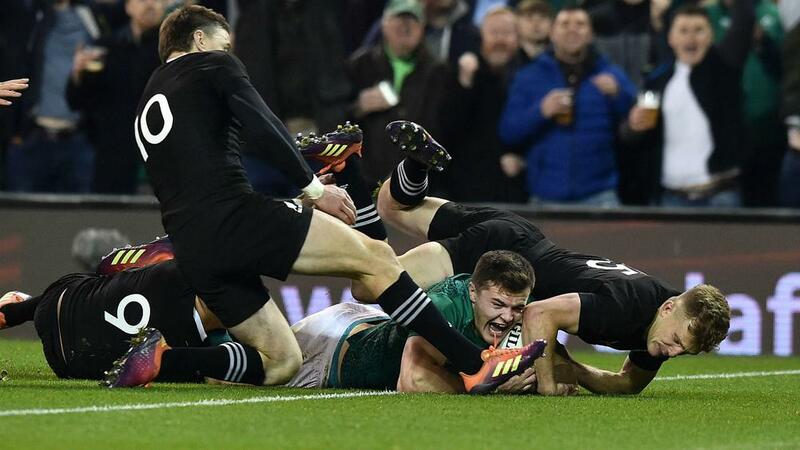 Peter O'Mahony made a heroic try-saving intervention before Barrett's penalty set up a tense finish, but Ireland's backs-to-the-wall effort got the job done to spark wild celebrations in Dublin.